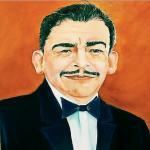 Álvaro Guevara y Vázquez, Composer, B.M.I. Gott Mit Uns. Sign up for Broadjam today to follow Álvaro Guevara y Vázquez, Composer, B.M.I. Gott Mit Uns., and be notified when they upload new stuff or update their news! Nocturne Opus 13. No.2. 1980 "Las Mariposas"
Ballad Opus 51. "En Recuerdo De Rafael"
Impromptu Opus 15, 1980 "Dreams of Childhood"
This is an audio introduction of how I became a composer. Enjoy! Laughter is our greatest gift! To laugh,is to live! Thanks for supporting Álvaro Guevara y Vázquez, Composer, B.M.I. Gott Mit Uns.! Would you like to help Álvaro Guevara y Vázquez, Composer, B.M.I. Gott Mit Uns. get heard by industry pros by buying them a song submission credit to Broadjam Music Licensing Opportunities?